A missile-like object, used to test air inlet efficiency, buried its nose in the ground. 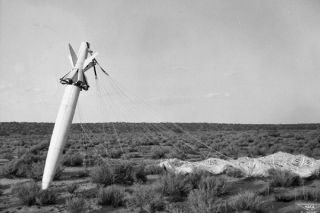 In this historical photo from the U.S. space agency, a missile-like free-falling body was dropped from an altitude of seven miles in January of 1955. The purpose of this drop was for the NACA to investigate the efficiency of air inlets of a type suitable for high speed jet aircraft. Its descent rate is checked first by automatic dive brakes (seen partially open) and then by parachute. The body has buried its nose in the California desert. The delicate onboard instruments which recorded performance data were recovered intact. The National Advisory Committee on Aeronautics (NACA) was a precursor to NASA. NACA was created by Congress in 1915.